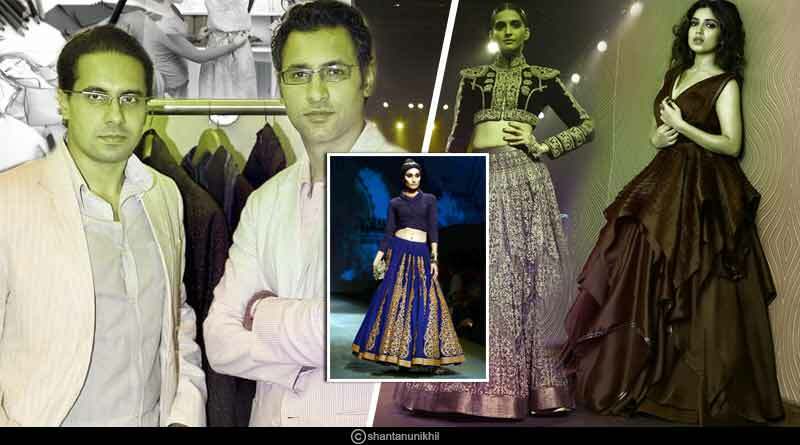 What do you know about the Fashion Industry icons and brothers Shantanu and Nikhil? The winning combination of two brothers with a creative heart and entrepreneurial mindset, Shantanu Mehra and Nikhil Mehra has carved a niche for themselves in the global forum. In 1999, they launched their label ‘Shantanu and Nikhil’ which caters to the young, trendy, stylish and vivacious populace of the world. The brand targets their audience who are extrovert and effervescent, with a sense of chic and classiness. The brand aim is to bring out the stylish line of clothes for the workplace, going with the recent flow of power dressing at one’s vocational front. The urban youth desires to be contemporary, yet conservative and the brand comes out to be a clear winner in this segment. Nikhil Mehra pursued his masters in Fashion from Fashion Institute of Design and Merchandise (FIDM), Los Angeles and Shantanu completed his MBA in Finance from Ohio State University. Nikhil worked for St. John Knits and Shantanu was with the corporate finance wing of General Motors. In 1999, their love affair with the USA ended, after which both came back to India chasing their dream of launching a contemporary fashion brand. In 2000, they gave birth to their brand ‘Shantanu & Nikhil’. They believe in excellence at its best and have been delivering the same ever since. On and off screen, the duo has dressed the best among the best. Their clientele list includes celebrities like Amitabh Bachchan, Serena Williams, Stephen Fleming, Sania Mirza, Hrithik Roshan, Dia Mirza, Kareena Kapoor Khan, Sonam Kapoor, A R Rehman, Priyanka Chopra, Shilpa Shetty, Deepika Padukone, Arjun Kapoor, Sonakshi Sinha, Ileana D’Cruz, Aditya Roy Kapoor to name a few who adore their brands. Their historic tie-up in 2010 with Adidas made them the only Indian designers in the world to have collaborated on such a strategic alliance. These versatile designers ventured into the burgeoning space of interiors in 2014 that would keep accelerating the bespoke horizons of timeless & eternal residences. The Duo has their two signature stores in the prime locations of New Delhi and has a strong presence in couture stores nationally and internationally. Internationally labels are available in Dubai, Kuwait, Tokyo, Switzerland, Birmingham, London, Jeddah, New York and Vancouver. The duo is diversifying their boundaries and has set a benchmark over the period and will keep augmenting their horizons for measureless time, making the brand eternal. For more articles like Shantanu and Nikhil, do Subscribe to our newsletter and follow us on Facebook, Twitter and Google+.